Here we go with yet another entry into the overstuffed zombie warfare genre. 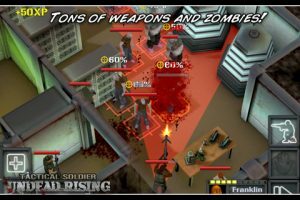 While it seems that at least a dozen new zombie-themed games are released on the App Store each week, Tactical Soldier: Undead Rising by Full Control ApS does put a slightly unique spin on what’s becoming an overused theme. Rather than being a simple run-and-gun shoot-a-thon, TS:UR is a turn-based game that, as its name implies, relies more on tactics and strategy than merely blasting everything in sight. Players will have to monitor their Action Points as they decide on which actions to perform, and the game’s “board game” aesthetic will require you to think a few moves ahead as you navigate through zombie-infested levels. 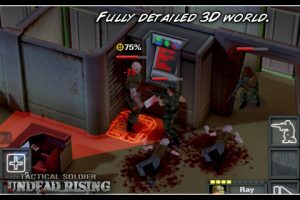 Though it’s not a perfect game by any means, Tactical Soldier: Undead Rising does provide plenty of eerie thrills for strategic-minded gamers. Playing as a soldier on a military base, you’ll begin with a tutorial, led by an almost criminally condescending Drill Sergeant. Throughout the process, you’ll learn the basics: moving around the play-field, controlling the camera, using items and weapons, and healing your character. Everything is controlled via various touches, swipes, and pinches. It’s mostly intuitive, though there are a few sore spots. For example, the camera is a bit loose, and can go swinging wildly in one directly or another as you attempt to zoom in or out. Oftentimes, after pinching to zoom you’ll need to readjust your view in order to properly see your character. 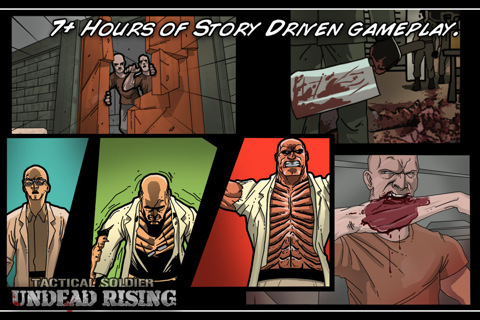 Shortly into the campaign mode, you’ll begin to encounter the dreaded zombies. To defend yourself, you’ll need to rely on locating dropped items and weapon caches. Moving around the field is achieved via a grid showing you your range. Tapping your desired location generally works well, but isn’t always completely accurate, especially the further you zoom in. This inaccuracy may cause you to have to replay your move. It is for this reason that the game is best played on an iPad, rather than the tiny iPhone screen. These minor annoyances aside, Tactical Soldier: Undead Rising actually succeeds in many areas. The atmosphere, combined with the deliberate planning of turn-based gameplay, help to provide an intense and creepy zombie experience. Rather than simply gunning your way through hordes of the undead, the game gives off a spookier vibe. For example, as you haphazardly rounding a corner without surveying the lay of the land may place you in the middle of a pack of undead goons. And the moment these walking corpses see you, they’ve got one goal: to eat your brains. In addition, in spite of the wonky camera, the game is laid out remarkably well, feeling almost like a board game in the vein of Last Night on Earth or Zombies!!!. As an added touch, should you lose track of where you’re supposed to go, there are arrows to guide you to your next objective. 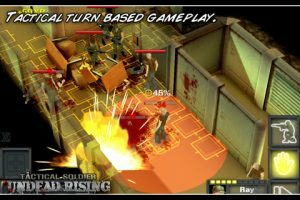 Bottom Line: Though Tactical Soldier: Undead Rising has its share of issues, it’s still a worthwhile experience for strategy fans looking for some scares. Tactical Soldier: Undead Rising is compatible with iPhone 3GS, iPhone 4, iPod touch (3rd generation), iPod touch (4th generation), and iPad. Requires iOS 3.2 or later.